When many of us think about automotive repair, our minds tend to go more toward the mechanical components as opposed to the electrical ones. However, vehicles these days have more electronic amenities than ever before. Electrical systems are crucial to any modern-day car, and without them, many cars wouldn’t be considered “modern” by today’s standards. Whether those electrical systems would include sensors that monitor the road activity around you or those responsible for regulating your car’s engine fuel intake, each electrical component plays a significant role in your car’s daily operation. With that said, it’s safe to assume that any type of electrical breakdown can be serious and potentially render your car inoperable. Auto electrical repair can be quite costly, and your car’s electrical system is much more important than simply keeping your luxury items operational. Recognizing the signs of electrical problems in your car is important. and Say Goodbye to Electrical Car Issues! The most common electrical problem you will deal with is the inability to start your car. This could be due to a problem with the battery, the starter, or the alternator. If your interior lights are still working, you’re probably looking at a bad alternator. If you turn the key and get a clicking noise, this is most likely caused by a bad starter. If you turn your key and nothing happens, you most likely have a dead battery. 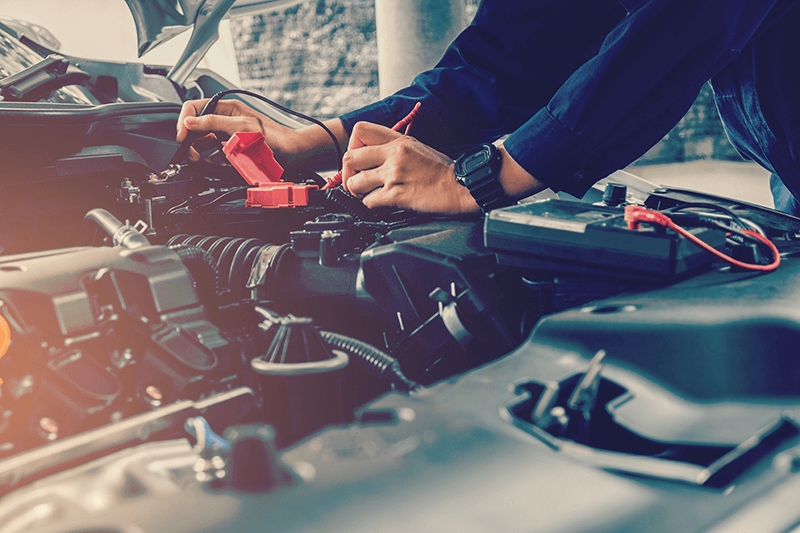 A car battery typically lasts between three and four years, and if your battery is damaged, you may find it to have corrosive buildup on or around the connection. If that is the case, the battery may simply be on its last leg and will need to be replaced. You can easily identify a damaged battery by opening the hood of your car to perform a visual inspection. You should always be cautious with a damaged battery and wear protective gear as the contents leaking from the unit are harmful to your skin and eyes. Your headlights, dashboard lights, or both may go dim while you’re driving at low speeds or while your vehicle is idling. In this case, there may be an issue with the battery, the alternator, or the voltage regulator. As your voltage begins to drop, your lights begin to dim and certain devices begin shutting off to conserve energy. If the voltage drops beneath a certain level, your traction control may shut off, and before long the vehicle may stop running completely. If your brake lights aren’t working, even after you’ve replaced both bulbs, the problem could be the fuse. This is usually the case with a more specific malfunction such as your lights or stereo. Since your electrical system in your car is pivotal to the vehicle’s primary functions, it is important to be able to recognize problems before they get worse. The most common auto electrical problems you may encounter are listed below. Sometimes you can discover and rectify these problems on your own. Other times you will need to bring the vehicle to a licensed professional. Bad spark plugs will stop the electrical current of a component at its source. Whereas a problem with the wires will interrupt the path through which the electricity is flowing. Rough idling or lurching would be common symptoms of spark plug problems. If the engine will crank but will not start, this too is a symptom of bad spark plugs. The problem could be as simple as having a dirty or loose spark plug. You could also be dealing with a bad wire or a bad connection. Checking and replacing the spark plugs in your car used to be one of the simplest things to do. Now that the engine compartments are covered in electrical sensors and tubing, this isn’t as easy as it used to be. If you can access your spark plugs easily, look for discoloration or physical damage. Otherwise, you may need to have a professional mechanic inspect your engine. If you are driving and you sense a burning plastic smell, this could be a wiring problem. This should never be ignored as faulty wiring could be overheating and melting the insulation around it. This problem should be handled immediately because it could result in a fire while you’re driving your vehicle. 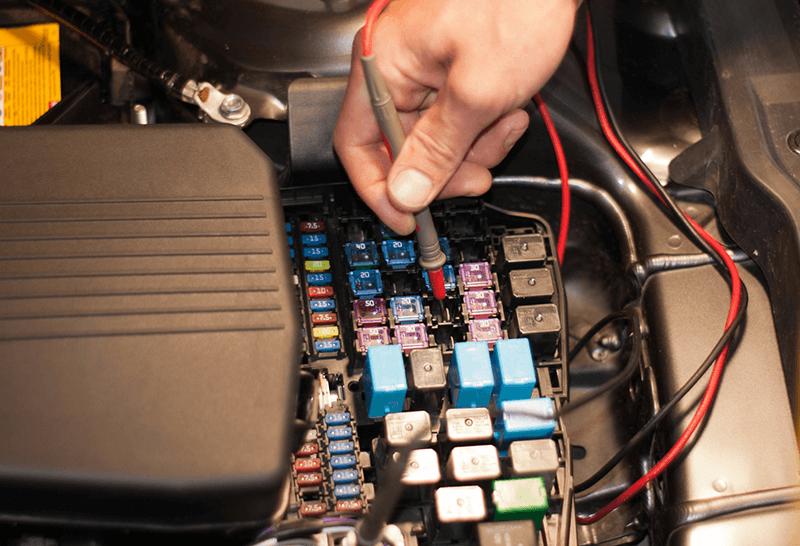 Your vehicle’s electrical systems are all connected to the fuse box. This is to make sure that the proper amount of power is reaching each system. If a fuse goes bad, the component it is connected to will shut down. The good news is that fuses are cheap. So, if the problem your vehicle is having can be traced back to the fuse box, it should be simple and inexpensive to repair. Blown fuses will be the cause of loss in power in a particular system such as power windows, brake lights, or your stereo unit. Your battery is the source of all electrical activity within your vehicle. If your battery is dead, it will not deliver the energy required for your vehicle to function. The battery also stores electrical energy for when the vehicle requires it. If your vehicle is cranking but not turning on, it is not getting the necessary energy it needs to start the motor. This could be caused by your alternator. If your vehicle is unable to start after several attempts (or the initial attempt) and shows little to no sign of life, it is probable that your battery is dead. If your battery is not working, it may not be connected properly. If there is a build-up of corrosion on the terminal ends, the battery cannot properly power the electrical system. In this case, you need to remove the cables from the battery and utilize a chemical terminal cleaner. It may simply need a jump-start. A pair of jumper cables hooked to your battery, and the battery of a running vehicle will jump-start the battery. Be sure that both vehicles are turned off before you apply the jumper cables to prevent electric shock. Allow the running vehicle to push energy into your battery for several minutes before attempting to start your car. Once your engine starts, allow the cables to continue to juice up the battery a few minutes longer to ensure a good charge. If the battery is actually dead, the only recourse is a replacement. Remove your battery and bring it to a repair facility. These facilities can recycle your old battery and provide you with a new unit that is the proper size and voltage for your vehicle. The alternator supplies the electricity to your vehicle while the engine is running. It also charges the battery while the car is running so that once you shut it off, it has the power to start again. If your alternator fails, the battery will be left to power all the electrical components in your car. This drains the battery and diminishes its life span. This is also what causes a car to shut off while driving. 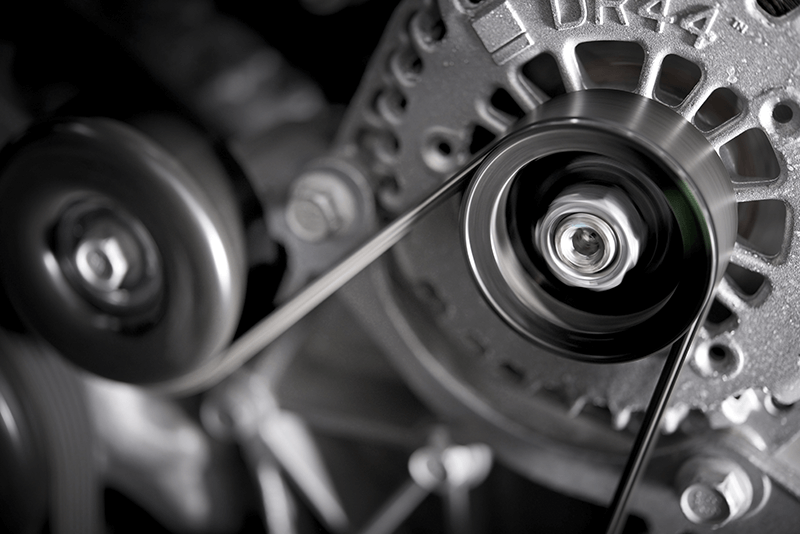 If you suspect that your alternator isn’t performing properly, open your hood and check the alternator belt. If the belt looks slightly burned, this is an indicator that it is slipping. The metal rubs against the rubber and heats the belt. This will wear it out quickly. The belt itself is one of the more affordable parts you would need to replace in your car. If the belt doesn’t appear to be the problem, you need to check the alternator itself. You can either use a multimeter to find out if the voltage in your vehicle is correct or take your car to a mechanic to perform this test for you. The electrical system in your car is extremely important. Without regular diagnostic checks and regular maintenance, something as simple as failure to replace your battery can be catastrophic. A problem diagnosed early can save you a lot of money and headaches. This can also ensure that you, and the people you care for, can ride safely in your vehicle. Take your car in for frequent checks to ensure voltage is correct in your electrical system and prevent further damage to all its components.